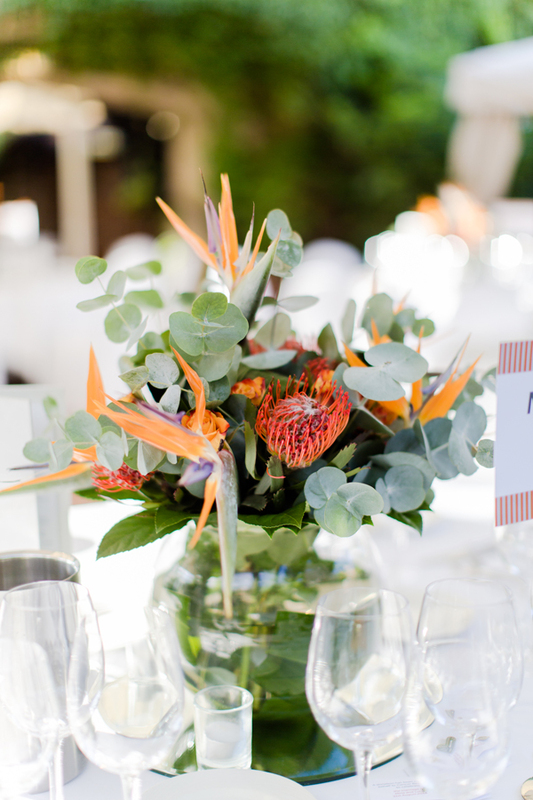 TFD » Blog » Posts tagged "Table"
Summer is the season of warm evenings, golden light and an abundance of colourful blooms to choose for wedding flower decorations and to adorn private events. As well as weddings, there are garden parties, birthdays, baby showers and many other reasons to celebrate. Maybe even to just celebrate the sunny summer days! London florists have wonderful options for table displays this time of year – whether the occasion calls for a more natural, low-key look or glamorous arrangements. From garden flowers like delphiniums and cornflowers, to classic peonies and roses, there is an abundance of choice for floral table arrangements this time of year. Sweet Williams are delightful little flowers available in early summer. In colours of pink, purple, red and white, their frilled, velvety petals and green fronds make them perfect for creating rustic, garden looks for private events. These aren’t showy flowers, so rather than table centrepieces small bouquets could be dotted down a table in mismatched jars and bottles to act as adornments or place settings. These fragrant flowers also make lovely bridal wedding bouquets, so Sweet William table decorations for wedding flowers could be the perfect complement to the bride’s posy choice. Cornflowers are also ideal for creating a rustic, pretty event flower look. Add them to a glass vase for a simple centrepiece at summer party, or decorate tables with small vases of these blue flowers. Dahlias, daisies and herbs like lavender can be used in similar ways. Cornflowers are also wonderful paired with long-stemmed larkspurs and delphiniums which can be used together to create harmonious displays of pinks, blues, purples and white – an ideal rustic event flower design centrepiece. Use a glass vase or a jug or even a watering can for a quirky look. Don’t be afraid to create a party or wedding flower centrepiece that spills over the table to create a truly bountiful look. Add full, fragrant blooms like hydrangeas, geraniums and delphiniums to a pitcher or tureen at the centre of guests’ tables and dot smaller vases around the centrepiece for a full and colourful display. These flowers are available in many shades – from dark purples and pinks to pale greens, peach and white – so any look for the occasion can be created. Summer is the time of year when wedding florists are called upon to create glamorous floral displays for the ceremony venue and wedding reception, including table flower arrangements. Rich, bright colours are the order of the day – with beautiful light in this warm season able to really showcase event floral design for guests to enjoy. A silver tureen filled with candy-coloured flowers including roses, hyacinths and hydrangeas makes for a decadent floral centrepiece. Hydrangeas are a great choice for summer table decorations and add texture and fullness to bouquets. A bouquet of single coloured hydrangeas – say just white or pure pink – can create a truly elegant look for tables at events. Alternatively, incorporate other textures and colours by using flowers like roses, baby’s breath and peonies. Silvery eucalyptus leaves also work well in hydrangea arrangements, as do longer branches and twigs to create a textural feel. Roses are perfect for weddings and any other special occasion. With their wide range of colours and shapes, these classic flowers can be used to create many different looks – whether incorporated into bouquets with other flowers or displayed on their own. Single roses in mini glass vases make great wedding flower decorations for guests’ tables and can be used as place settings. Choose colours that match the wedding party bouquets. For a soft, romantic look, choose paler shades of roses for wedding flower arrangements – like peach, mauve, white and dusty pink. When delicate foliage is added, these displays will add beauty and glamour to the proceedings in a subtle way. Peonies are another flower available at this time of year and with their full shape and vibrant colours, another perfect choice for the glamorous look. Like roses, they range in colour from soft pinks to deep reds and can be used to create so many floral designs – from romantic, to high-end and casual. They work very well with roses and green embellishments. They can be added to table budvases too – and London florists can create these using many different flowers including orchids, roses and dahlias. These are perfect for restaurants but also work well at weddings and other private events where little details are very important. Summertime is of course a season of colour and flowers – but there are also plenty of green options to make beautiful table centrepieces. Bring the woodland to the table and use natural elements like fern, moss, branches and leaves to create centrepieces and decorations. Ornamental kale is also a great option for a quirky and on-trend look. Looking much like a flower and available in shades of green, purple and white, this is often a favourite for wedding flower bouquets and can also be incorporated into table displays at weddings and other private events. White kale flowers are paired with bright pink roses and greenery in a delightful basket arrangement that is perfect for garden parties on indoor dos with a rustic feel. Incorporate natural elements like moss, bark, twigs and pebbles into table displays – especially for laid-back dos like garden parties or a woodland wedding. Ivy can be trailed down the centre of tables and even miniature trees can be displayed on tables for decoration. For a more exotic look, consider palm leaves either on their own or paired with blooms like orchids and bird-of-paradise flowers. Ever-popular succulents make lovely place settings and can also double as favours – whether in mini vases or as potted plants with name tags attached. With their soft shades of green, succulents also work well in floral displays using pastel shades of pink, purple and white. Take a look at more table centre flowers to be inspired for summer parties.